Another week in National City brings us more of the Supergirl-Superman team-up, a new dastardly villain with the power to shove kryptonite into people and make them anti-Kryptonian weapons, Kara’s mean new boss, and the revelation that Cat Grant is quitting CatCo in order to dive into bigger and better things. Coma Dude from last week is only given a passing mention and, sadly, Lena Luthor is not around this week to smirk at us — but I’m sure she’ll be back eventually. Onwards! WHAT’S GOING ON IN NATIONAL CITY? Superman’s still hanging around National City. I sure hope Clark left someone in charge of the superheroing in Metropolis or occasionally makes the trip back to save a few old ladies from burning buildings, because otherwise he’s a jerk. I don’t care how cute a family team he makes with Kara. Metropolis gets attacked enough to warrant its own alien protector, so I’m pretty sure the villains aren’t going to go on a convenient vacation while Kara and Clark have a miniature family reunion. But Clark’s sticking around because a new problem has risen up from the depths of the season’s plot: John Corben (he was the one trying to kill Lena last week) has been brought back to life as the stupidly named Metallo and can launch kryptonite beams from his chest. During the first fight of the episode, one of the beams hits Kara just hard enough for Superman to reenact a famous Crisis on Infinite Earths cover, but no worries! Kara’s fine. Yeah, two episodes into the show Supergirl and I was totally scared that they would kill off Supergirl. That was truly a thrilling moment. The main threat of the episode is Metallo — and Metallo: The Sequel, who shows up a little later — and the DEO has to go about finding a way to protect Supergirl and Superman from the Metallo chest beams. They put Winn on the job because otherwise his only roles would be to make annoying asides and fanboy over Superman. The Metallo plot is only vaguely interesting and sort of rushed, considering the dramatic buildup we got at the end of the last episode. I assume its role was mainly to introduce the Cadmus woman who created the Metallos and to limply parallel her anti-alien stance with the sudden rift that occurs between Alex and Kara. That rift happens because Kara contemplates moving to Metropolis with Clark, which angers Alex because Clark literally just became a part of Kara’s actual life while the Danvers family helped raise her since she arrived on Earth. Alex has a point. Kara’s reasoning is also sound, from her perspective, but the whole argument is a lot of the writers telling instead of showing. In my opinion, this sort of character crisis would have been better utilized much later — perhaps after building up Kara’s feelings of loneliness for several episodes and then giving her Clark to latch onto for support. Two episodes into the season — what’s probably only a few days, in-show, after the big group celebration that ended season one and solidified Kara’s place on Earth as part of a family — and this feels rushed. I think it’s kind curious that the Cat Grant storyline, which was designated by real life writing the plot and therefore could have been excusably rushed, ended up giving the episode some of its best moments. Maybe it’s the chemistry between Kara and Cat, or maybe it’s just because Cat Grant is a character who’s hard not to love, but the scenes involving the two of them were the definite highlights of the episode. This show’s ability to get things wonderfully right make me even more confused when they fumble promising ideas. When I learned that Supergirl would be bringing in Superman for a few episodes, the first thing I thought was “Hey, they can afford Superman now!” and the second thing I thought was “Please don’t overshadow Supergirl.” I know a lot of people were afraid of the same thing. There are tons and tons of shows, comics, movies — pretty much everything, in every medium — telling the story of Superman. There’s significantly less telling the story of Supergirl, whose story is so very untold that a single, concrete, canon explanation for her doesn’t even exist. She was a female counterpart to Superman, and that’s pretty much where the 1950s brainstorming session ended. So I did want to see Supergirl’s story get told, and I wanted it done outside of the shadow of her more prolific cousin. 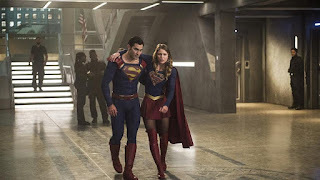 I was pleased with the presentation of Superman in the Supergirl show as a very famous and well-loved hero who still just wanted to hang out with the only other member of his family on Earth. He’s a great Superman and exactly the version of the character we need to see, in order to make up for the truly awful version we’re getting in movies right now. Plus, I realized that the addition of Superman meant the show could explore more Krypton stuff: Kara, after all, was thirteen or so when she left her planet. Wouldn’t it be great for her to have a few scenes explaining to Clark, from a first-person perspective and not via some artificial intelligence, what Krypton was like? Superman’s presence in the show was a terrific storytelling opportunity, one that I really expected to pay off in this week’s episode. I mean, it’s called “The Last Children of Krypton” — if not now, when? Apparently never. If I have a huge problem with this episode (which I found underwhelming, but not terrible) I would say it’s the missed opportunity of the Kara and Clark relationship going deeper than some mutual “I really think you’re cool!” feelings. Yes, they are the last children of Krypton — why not explore that a bit, Supergirl? You give us one line about Kara not feeling so alone around Clark, but most of the episode is completely unrelated to Kryptonian orphans, familial bonds, or loneliness. Kara struggles a bit with her new job, learns that Cat Grant is leaving CatCo, and punches some kryptonite-charged buff guys in the face. Most of the time she spends with Clark, she spends it fighting things or putting out fires — heart-to-hearts are largely absent, and Kara’s declaration that Clark Kent leaving National City is up there with all the important things in her life that are changing (see: Cat Grant, new job, etc.) feels undeserved. 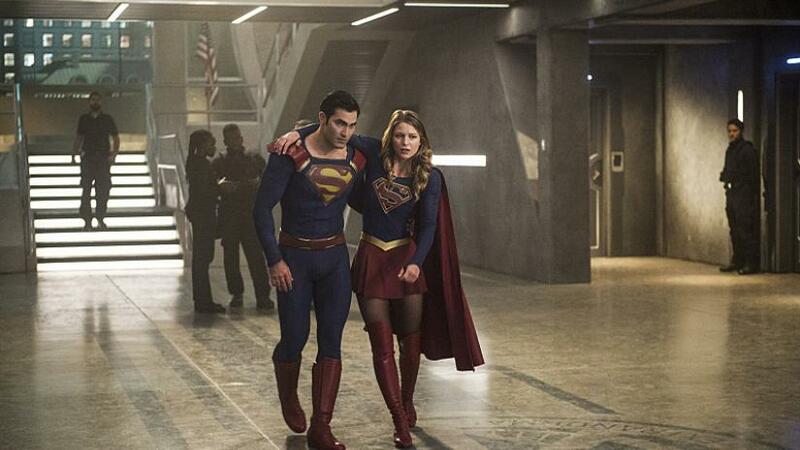 The addition of Superman to Supergirl could have been something more than a grab for ratings. It could have been a way to deepen not only Kara’s past, but also her existence on Earth as one of only two Kryptonians (well, maybe three — there’s still Coma Dude, who wakes up at the end of the episode). Maybe they’ll do more with Superman/Clark in the future and it’ll live up to the expectations I had, but for now it was really just an amusing guest appearance that affected very little in the long run. It’s only just begun, but I’m already incredibly bored by Kara’s reporter storyline. This “beginning reporter vs. grumpy editor/boss” plot is just so tired. We know exactly how it’s going to play out, beat for beat, and I don’t really expect Supergirl to surprise us with it. Sure is a good thing that kryptonite in the Supergirl universe isn’t anything like the kryptonite from Smallville, or else the whole DEO would be full of meteor mutants. J’onn also gets Fight Move of the Week with that whole “ripping out Metallo’s heart” thing. Cool! Oh yeah, and J’onn and Clark stop hating each other or something. I was barely paying attention to that part of the plot. Cat and Kara hug! Yaaaay!